1. Multiply by 3 . 2. Add 7 . 1. Subtract 7 . 2. Divide by 3 . Subtract 7 from each side. Divide each side by 3 . The correct answer is A . 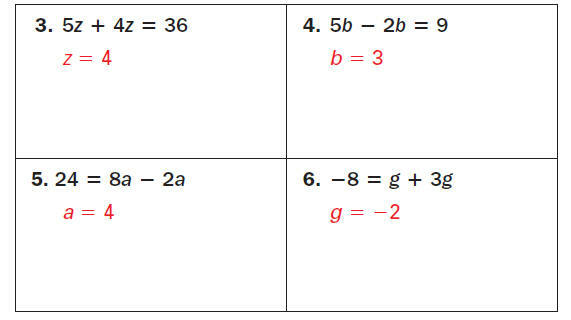 Guided Practice Solve the two-step equation. Check your solution. Solve 4a + 3a = 63. Divide each side by 7 . Guided Practice Solve the equation. Check your solution. The value of y is 2 more than 4 times the value of x. Find x when y = 14.
y is 2 more than 4 times x. Step 2 Solve the equation for x when y = 14. Divide each side by 4 . The value of x is 3 when y = 14 . Multiply 4 and 3 . 7. The value of y is 3 less than 6 times the value of x. Find x when y = 15.